In his latest book, Michael Ruhlman has taken a very practical approach to defining all the ways in which the glorious egg can be used. He started with a flowchart. The book is Egg: A Culinary Exploration of the World's Most Versatile Ingredient , and I received a review copy. The printed flowchart is included with the book, and it shows the categories that became the book’s chapters. First, the egg is considered whole and cooked in the shell and then whole and cooked out of the shell with recipes for each. Next, the whole egg, out of the shell, is covered with dishes in which the yolk and white are blended and then with the egg as an ingredient for doughs or batters. Last, recipes for each part of the egg appear with recipes for just yolks, just whites, and recipes in which eggs are separated but both parts are used. There are careful explanations for hard-cooked versus soft-cooked eggs and how to arrive at every stage in between. From that chapter, I want to try all three versions of egg salad. From the Cooked out of the Shell/Whole chapter, there’s a description of Eggs Benedict that will convince you to start making it regularly. And, in the Cooked out of the Shell/Blended chapter, there are step-by-step instructions, with photos, for a perfect omelet. I’ve made takes on shakshuka before, but I’d never thought of cooking eggs in Puttanesca Sauce for pasta. I’ll be trying that recipe soon. There are also recipes for pasta doughs, cakes, egg-rich breads, sauces, custards, and even cocktails with eggs. When it comes brunch, I make frittatas frequently. I’ve made them with all kinds of vegetable and/or cheese combinations. I’ve also made custard-filled pies and tarts both sweet and savory. But, for some reason, I had never made a true, classic quiche. When I saw the stately, tall, golden-brown, Classic French Quiche in this book, it was time to give it a go. For this quiche, Ruhlman suggests baking it in a parchment-lined, nine-inch cake pan. A big piece of parchment paper was pressed into the bottom of the pan and folded and creased up to cover the sides as well. The quiche was baked, cooled, and then chilled before being pulled from the pan with the overhanging parchment. Then, neat slices were cut and reheated for serving. I had memories of a spinach quiche I enjoyed at Bouchon at The Venetian in Vegas. That quiche was delightfully light and fluffy while still being deliciously rich inside the flaky pastry. That was my hope for this one. In the book, the quiche is shown with a filling of chorizo, roasted bell peppers, and cheddar cheese. Since I was making this for Easter brunch, I wanted something very spring-like for a filling. I visited the farmers’ market and found pretty, slender, young leeks; fresh, tender spinach; and of course, farm-fresh eggs. I sauteed the sliced leeks in butter and added a little finely minced garlic. I pulled the spinach leaves off the stems, steamed them, drained them, rolled the spinach in a towel to remove more moisture, and chopped it into small pieces. I stopped by Antonelli’s Cheese Shop to get advice on a good cheese to grate for this, and Holey Cow, a semi-soft Alpine-style cheese from California was suggested. It was perfect for the quiche. For the pastry, I used all butter and worked it into the flour by hand. The dough was left to rest in the refrigerator overnight before being rolled out and fit into the pan. It was blind baked with weights before the quiche was assembled in it. Milk, cream, eggs, and salt and pepper were whisked together, and the quiche was built in layers. 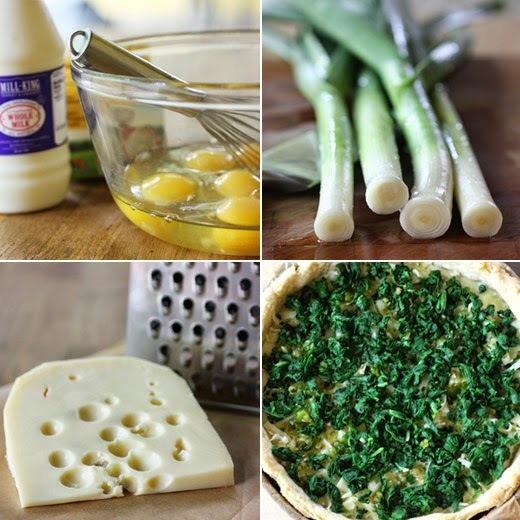 Half of the sauteed leeks and spinach went into the bottom of the crust, half of the egg custard was poured over them, half of the grated cheese was sprinkled over the custard, and all those layers were repeated. It puffed up nicely as it baked, and the cheese baked to a lovely browned, crusty top. Just as I'd hoped, this quiche was somehow light and fluffy and rich-tasting all at the same time. And, the cheese was exactly right. I’m thrilled to have finally made a classic quiche. Once again, Ruhlman’s style of teaching cooking techniques goes beyond just recipes. But, there are some great recipes here too. Recipe reprinted with publisher’s permission from Egg Copyright 2014 by Michael Ruhlman. All rights reserved. No part of this excerpt may be reproduced or printed without permission in writing from the publisher. Reprinted by arrangement with Little, Brown and Company. I was a youngster in the 1970s when quiche made its appearance on the Midwestern scene, only to be quickly lampooned as girly-man food. It was a time when French food was beginning to make its way into American home kitchens, thanks to Julia Child and the popularity of French restaurants in New York City in the previous decade. But a lot of things got lost in translation. Spinach salad with bacon vinaigrette was the only way we Midwesterners could re-create a classic salade frisee aux lardons. And we cooked quiche in a piecrust—too thin to be of any deep pleasure. It wasn’t until decades later, when I was working with Thomas Keller and Jeffrey Cerciello on the Bouchon cookbook, that I learned all that a quiche might be. It is little more than an egg pie, a custard pie, but when it’s cooked at a proper thickness, it can become utterly seductive. Again, it’s all about the power of the egg to transform the ingredients it joins. In France, a common quiche is Lorraine, with bacon and onions—and if you’re sticking with its peasant roots, no cheese. Or Florentine, with spinach. Here, to show off the versatility of quiche, I’m using sausage, onion, and roasted red peppers. But you can use any flavorings you wish as long as you bake the quiche in a 2-inch/5-centimeter ring mold or cake pan (alas, a springform pan will leak). 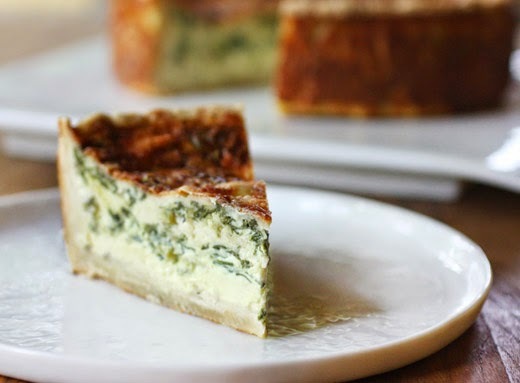 I treat a quiche like a cake, pressing the dough into a parchment-lined cake pan, so even if it does leak through the crust, you’ll still have a thick, creamy quiche. The amount of dough in this recipe will fit a 9-inch/23-centimeter mold with plenty left over for patching should you need it. If you have only an 8-inch/20-centimeter mold, you’ll have even more dough left over, which can be frozen for later use, or you can reduce the amounts of the crust ingredients by one-third if you’re measuring by weight; you’ll also have some custard left over, which can be baked separately in a large ramekin (it will take 20 to 30 minutes to cook). To make the crust, combine the flour, fat, and salt in a mixing bowl and rub the fat between your fingers until you have small beads of fat and plenty of pea-sized chunks. Gradually add the ice water and then the salt and mix gently, just until combined—if you work the dough too hard it will become tough. (If you’re making a bigger batch, you can use a standing mixer with a paddle attachment, but remember not to paddle too much after you add the water, just enough so that it comes together.) Shape the dough into a disc, wrap in plastic, and refrigerate for at least 15 minutes or up to 24 hours. The dough can be used raw for some recipes, as with an apple pie (it’s enough for a double-crusted pie). But for a quiche or other pie with a liquid batter, you’ll need to bake the shell first (known as blind baking). Preheat the oven to 325˚F/165˚C. Line a 9-inch/ 23-centimeter cake pan (or a ring mold placed on a baking sheet) with parchment. Roll the dough into a circle about ¼ inch/6 millimeters thick. Roll it over the rolling pin to lift it and unroll it over the parchment-lined cake pan, pressing the dough into the corners (use a scrap of dough to do this to avoid tearing the dough with your fingers). To blind bake a crust, you need to fill the shell with something heavy to prevent the bottom from buckling up. Pie weights are made specifically for this, but a layer of aluminum foil and a pound of dried beans or rice reserved for this purpose does the job just as well. Line the bottom of your shell with another layer of parchment, then add the pie weights or beans and bake for 20 minutes. Remove the parchment and the weights or beans and continue baking until the crust is golden brown and cooked through, another 10 to 15 minutes. Cool completely. To make the quiche, heat 2 teaspoons of the vegetable oil in a sauté pan over medium heat. When hot, add the chorizo and sauté for a few minutes till warm; remove to a plate lined with paper towels. Add the onions to the same pan with the chorizo fat, along with a four-finger pinch of salt, and sauté until softened, about 10 minutes. Add the roasted peppers and stir just to combine (they don’t need further cooking). Remove from the heat and add to the plate with the chorizo. (The filling can be made up to 1 day ahead, as can the quiche shell—either raw or blind-baked). Preheat the oven to 325˚F/165˚C. 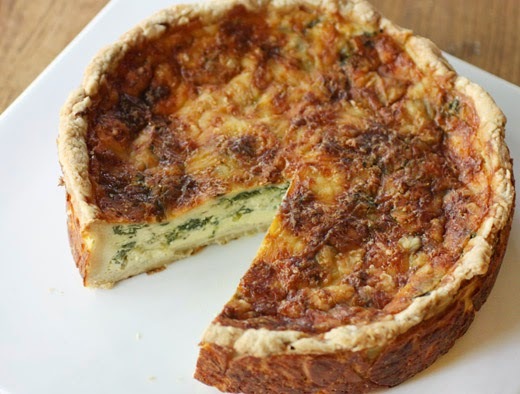 Use raw leftover dough to patch any cracks that opened in the quiche shell as it baked. Place it on a baking sheet. In a large liquid measure or mixing bowl, combine the milk, cream, eggs, salt, pepper, and nutmeg and, using a hand blender, blend until frothy. This can be done in a standing blender as well, though you may need to do it in two batches, depending on the size of your blender. Or you could even mix the batter in a large bowl using a whisk—in this case, beat the eggs first, then add the rest of the ingredients. The idea will be to add the ingredients in two layers, using the froth to help keep the ingredients suspended. Layer half of the chorizo mixture into the shell. Pour half of the frothy custard over the mixture. Sprinkle with half of the cheese. Layer with the remaining chorizo mixture. Refroth the batter and pour the rest into the shell. (You may want to put the baking sheet with the quiche shell into the oven and pour the remaining batter into it there so you can get every bit into the shell. You can even let it overflow to make sure it’s up to the very top.) Sprinkle the remaining cheese over the top. Bake until the center of the quiche is just set, about 1 1/2 hours (it may take as long as 2 hours, but don’t overcook it; there should still be some jiggle in the center when you take it out of the oven). Allow the quiche to cool, then cover it with plastic wrap and refrigerate until it’s completely chilled. The quiche will keep for up to 5 days. To remove and serve the quiche, use a knife to cut off the top edges of the crust along the rim or simply break them off by hand. Tug the parchment gently and lift the quiche from the cake pan; if using a ring simply press gently on the bottom once the sides are loosened. Slice and serve cold or, to serve hot, slice and reheat for 15 minutes in a 350˚F/180˚C oven on lightly oiled parchment or foil, or cover with plastic and microwave for 1 minute. Note: To roast bell peppers, set them directly over a gas flame and cook all surfaces until they’re black. You can also halve them and broil them, cut sides down, till black. Remove them to a paper bag or put in a bowl and cover with plastic wrap till cooled. Remove the charred skin under cold running water. To use, remove the stem and seeds and cut as directed. A fabulous quiche! Very tasty looking. Perfect for taking on a picnic. Wow is your quiche stunning! I never get a deep gorgeous quiche like this! I will try this recipe... and it really is a classic French combination of ingredients. People don't cook with leeks enough anymore (accept the French!). I also need this book; oddly enough I have been craving eggs lately! Your quiche looks exquisite! With a glass of white wine, this would make a great lunch for me. Looks so delicious! Great for any occasion! I've been reading great reviews of this book, and you've added to the buzz. Sounds like a super book, and certainly this quiche recipe is excellent. Good post -- thanks. this looks unlike any quiche i've ever encountered! i love eggs and i love ruhlman, so i'll be keeping my eye out for that book! Nothing better than the taste of a classic Quiche. This quiche is beautifully done, Lisa! The leek and spinach sounds really tasty. I would love to have a slice for brunch tomorrow. I always feel as though somethingis missing when there aren't eggs in the fridge. They're so versatile! It looks like the quiches for purchase at a local French bakery, Sandrines. Very classic dish and looks gorgeous too. Beautiful quiche, Lisa! A great execution of the recipe. Beautiful! Quiches are always so pretty and so delicious. Oh this does look heavenly! We will soon have baby leeks and spinach in the garden, so I think it will make an appearance here very soon! What a beautiful looking quiche…a great idea to cook it in a cake pan. I swear quiche the next day, served cold with a nice white wine is the ultimate treat. I would have used a cake pan too, any way to make hard stuff easier I will find a way! As a serious lover of the almighty egg, I'm pretty sure I need to get my hands on this cookbook. Or at the least make this quiche, which is quite a beauty! That is one beautiful looking Quiche. I haven't made Quiche in such a long time. I do remember those days of "Real Men Don't Eat Quiche" lol...Good thing that has changed!!! Love the idea of lining the pan with parchment. That is the one thing about quiche, getting it out of the pan neatly has never be one of my fortes. Thank you so much for sharing, Lisa...I'm sure this made a perfect Easter brunch dish. This looks unbelievably well executed. I'll have to put this on my menu for brunch this sunday! It's nice and tall, I prefer the deep dish quiches like this, for sure. Is there a cheddar cheese you would suggest?